The elegance and refined atmosphere of The Biltmore's wedding ballroom in Coral Gables, Florida may make it seem like party guests will be on their best behavior, acting with refinement and elegance themselves. 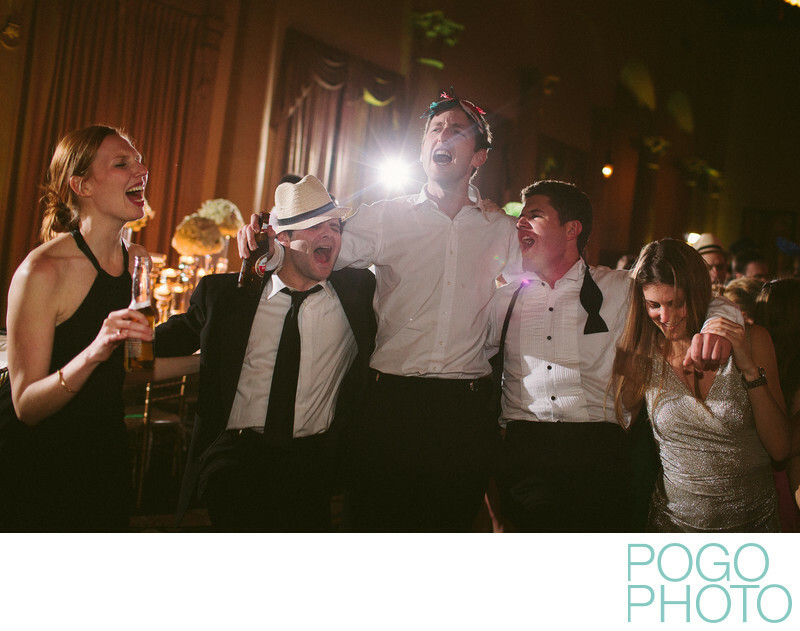 This is not necessarily the case; we've found that most guests have a couple of drinks and settle into their partying selves, as evidenced by this group of exuberant revelers toward the end of this wedding reception. They are obviously having a great time, so we don't think you need to worry about your younger wedding guests feeling intimidated by a high end wedding venue! The sense of movement in this image is highlighted by the slight tilt of the camera (done purposefully with some reception images to highlight the excited intoxication of the evening, both figuratively and literally), and the guests coincidentally staggered their heights in this grouping, creating a spiked pattern that calls to mind visual representations of music, which is appropriate for a singing and dancing image such as this. The women on either end of this image have nearly mirrored raised hands, the three men all have some state of undress happening, and the combination of the Panama hat, the raised Venetian feathered mask, and the perfectly undone bowtie combine for a sense of wild abandon and mild debauchery, all elements of an excellent party.